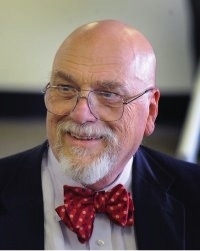 Dr. Glenn T. Miller (seen here in a later picture, after he had joined the Bangor Theological Seminary, Maine, in 1991) was a sought-after lecturer in Church History by Southeastern Seminary students. He is a graduate of the University of Richmond, Andover Newton Theological Seminary, and Union Theological Seminary. The lecture hall remained crowded when Dr. Miller spoke. An outstanding lecturer, he is heard here in a recorded lecture on the history of the church in the Old South. Seminary students gave it the moniker "The Confederate Ghost Lecture." (Note: as the lecture ends, you can hear the Seminary bell, which was rung by hand, peal the end of the class period). Dr. Glenn T. Miller "Church History Lecture"